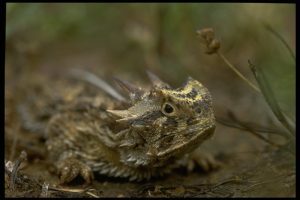 With a flat, spiky body, the Horned Lizard has captivated the generations of Texans. Everyone you meet, if you just mention horny toad, or horned lizard, they say” “Oh, I used to see those all the time when I was a kid; I would pick them up and put them into my pocket. But now I never see them. What happened to them”? That’s a question editor Louie Bond addresses in an article for the December issue of Texas Parks and Wildlife magazine. To get answers, she travelled to the San Antonio Zoo to meet with director of conservation, Andy Gluesenkamp. And he is raising horned lizards in hope of having babies in a few months, and putting them back into their historic habitats. Which includes arid and semiarid habitats in open areas with sparse plant cover. This habitat’s been fragmented by development. But it still exists. We’re actually tying into a whole other program at the agency, which comes from the mapping department. And we have this incredible interactive vegetative map of the whole state, broken into pretty small parcels of land. The biologists can look at the map and judge the habitat by a variety of criteria. So, they actually can rate each piece of land and make sure that it actually does have all the things that are needed there. The horned lizard article by Louie Bond is as fascinating as the animal itself. Read this in-depth feature in the December issue of Texas Parks and Wildlife magazine. On newsstands now. You are currently browsing the Passport to Texas weblog archives for the day Thursday, December 6th, 2018.